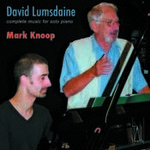 Complete music for solo piano / David Lumsdaine ; Mark Knoop, piano. Kelly ground : piano solo / David Lumsdaine. Kelly Ground is one of Lumsdaine's earliest acknowledged pieces, composed when he was in his mid 30s. Written for solo piano, its title refers to one of Australia's most famous historical figures, Ned Kelly, a bushranger whose defiance towards the colonial authorities eventually resulted in his dramatic capture and execution. As an abstract composition, Kelly Ground can be divided into two cycles the first of which comprises five strophes. The two cycles are radically different: the writing in the first is dense, lively, and virtuosic; the second is still and contemplative. The composition is formed from the pitch material of cyclic matrices (confirming the allusion in the title to the cyclic bass on which a melody is composed), which in the first cycle is employed linearly, row by row. The chords of the second cycle, on the other hand, are formed from the columns of the same matrix. By drawing critically on different musical traditions, Lumsdaine is able to create a space within which the social conventions that surround both music, and the legend of Kelly, can be contemplated. Analysis of David Lumsdaine's "Kelly ground"
Book: The music of David Lumsdaine : Kelly Ground to Cambewarra / Michael Hooper. Book: Between two worlds : the music of David Lumsdaine / Michael Hall. Book: Modernism in Australian music, 1950-2000 : eight case studies, including papers from the Symposium of the International Musicological Society, Melbourne, July 2004 / edited by Graham Hair. Article: The country of my childhood : reflections on David Lumsdaine's music / by Michael Hall. Article: David Lumsdaine's 'Sunflower' / Nicola LeFanu. Article: David Lumsdaine / Richard Cooke.